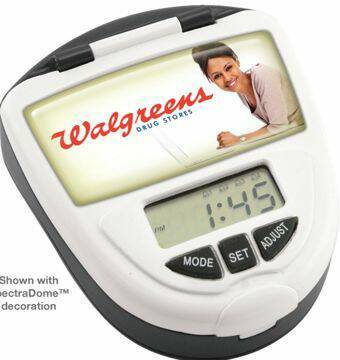 Personalized Medicine Timers Custom Printed in Bulk. Promotional, Inexpensive. Budget Prices in the USA and Canada. Bulk personalized medicine timer pill box custom imprinted in up to full color. 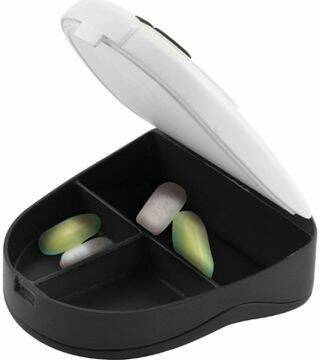 Convenient travel pill box with a countdown timer that sounds when it is time to take medicine. The timer may be preset to your desired interval between alarms. Timer pill boxes may save lives. We also supply blank (not imprinted) medicine timers: contact us. Free artwork design. Budget Prices in USA and Canada for wholesale medicine timers. American clients pay no taxes. Prices below include your 1-color custom imprint, or you full color imprint. Setup Charge: $45.00; no setups on repeats. Estimated Production: 7-10 days after art approval; Rush 3 day production is available: contact us. Our medicine pill box is equipped with a precision 24 -hour programmable timer and a strong beeper. The timer can be set up easily to sound an alarm whenever it's time to take your medicine, say, every 2, 3, 4 or 6 hours. Imprint Size: 3/4"x 1 1/2" Pad Print or 1"x2 1/8" Full Color. Packaging: Individual Gift Box with instruction sheet; 200 units per carton of 34 lbs.